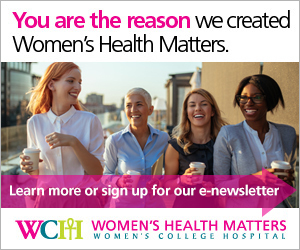 Women's Health Matters - Can BMI affect fertility? Having a body mass index (BMI) that is higher or lower than normal can affect many aspects of health, including reproductive health. Being overweight or obese, as well as being underweight, can affect fertility. Obesity in particular has been linked to increased risk of difficulty getting pregnant. Dr. Sheila Laredo, endocrinologist at Women’s College Hospital, explains that the BMI associated with optimum fertility lies in the middle of the normal, healthy weight range. The increased risk for trouble conceiving isn’t substantial for women who are modestly overweight, but it climbs with increased BMI, Dr. Laredo says. There is a marked increase in the risk for difficulty conceiving in women who are obese. Part of the reason BMI is linked to fertility is that women who are overweight or obese, as well as those who are underweight, have a higher likelihood of having irregular periods, Dr. Laredo explains. Even in those who do have regular cycles, women who are overweight or obese are still more likely to have difficulty getting pregnant than women with BMIs in the normal range, Dr. Laredo says. She adds that insulin resistance – which is more common in people with higher BMIs – may play a role, but researchers don’t know exactly how. Research has shown how challenging it is to lose large amounts of weight and to keep it off. Suggesting that women lose 50 pounds before trying to conceive is probably not realistic, so Dr. Laredo recommends more attainable goals. “We do try to get women to lose five to 10 per cent of their body weight if they can, and if they can do it in a healthy way,” Dr. Laredo says. That modest weight loss may improve the odds of getting pregnant, especially in women with irregular periods, because the weight loss helps re-establish more normal cycles. However, Dr. Laredo does not recommend rapid weight loss for women trying to conceive. Bariatric surgery has been shown to enable fast and safe weight loss. However, Dr. Laredo notes that women are advised to wait a minimum of one year, possibly two years, after the surgery before a pregnancy to have the best chances of a good outcome for mother and baby. Planning a pregnancy with healthcare providers helps ensure the best possible care even before a pregnancy starts, as well as during pregnancy. That can help achieve the best outcomes for both mother and baby, and help minimize risks associated with high BMI in pregnancy. Research has shown that when they do become pregnant, women who are overweight or obese have a higher risk of miscarriage than women with normal BMI. They also have increased risks for other pregnancy complications, such as high blood pressure during pregnancy. In worst-case scenarios, high blood pressure in pregnancy can progress to preeclampsia and eclampsia, which is a medical emergency. Women with high BMI are also at increased risk for gestational diabetes (diabetes in pregnancy), which increases their risk for later developing Type 2 diabetes. Overweight and obese women are also more likely to require a C-section, which carries its own risks, such as postoperative blood clots. Those who deliver vaginally are more likely to need forceps or vacuum extraction delivery because they tend to have larger babies. Some pregnancy risks associated with high BMI affect the baby. These include increased risks for premature delivery as well as for malformations such as neural tube defects, cleft lip or cleft palate, and cardiovascular malformations. There is also a higher risk for stillbirth and neonatal death. The best way to address some of these issues and minimize risks is through pregnancy planning, Dr. Laredo says. Other factors that can affect pregnancy risks include improving lifestyle habits, such as quitting smoking and eating a healthier diet. If it’s a reasonable goal, Dr. Laredo may recommend moderate weight loss before conceiving. “We also look at optimizing medication,” Dr. Laredo says, noting that women with high BMI may be more likely to have pre-existing health conditions. “Many of our patients who are trying to get pregnant who have higher body mass index may have diabetes. So it’s really important not to stop medication, but to adjust medication with their health practitioners in a safe way,” she says. Finally, it may be helpful to see a doctor with experience managing pregnancies in women who are overweight or obese.